My idea-partner Mark and I are currently fundraising money to make more Goodie Monsters, so we are offering rewards for people who support the project. 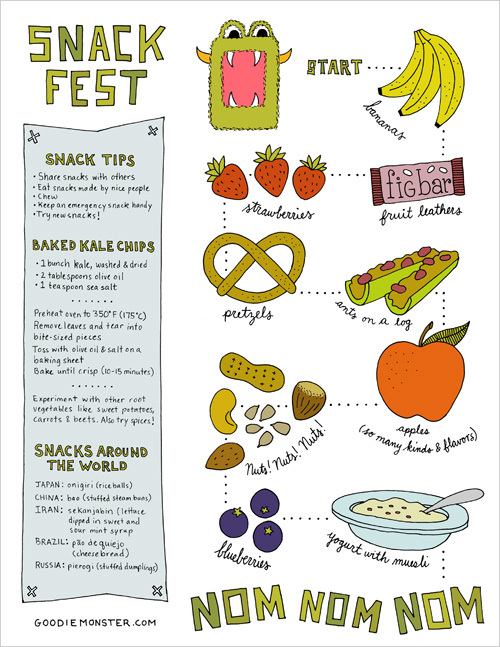 This reward is a PDF snack sheet with the Goodie Monster’s path to snacking, some tips, a kale chip recipe, and info about snacks from around the world. Personally I don’t go a single hour without thinking about what my next snack is going to be. 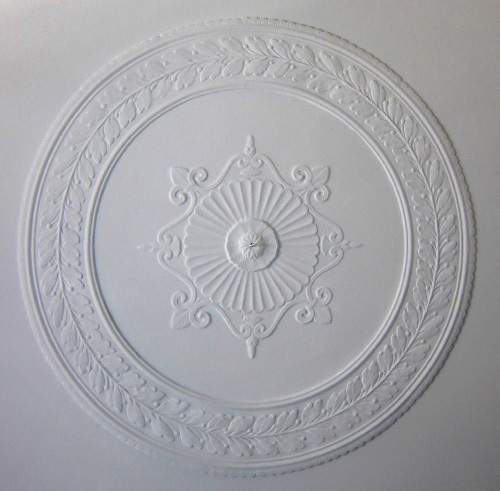 To back the effort, check out the campaign on Kickstarter. You can also experiment with other root veggies like sweet potatoes, carrots, or beets, and sprinkle on your own spices. 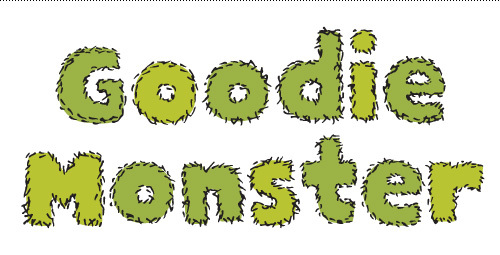 As part of our efforts to raise money to create more Goodie Monsters, we are offering rewards for people who support the project. 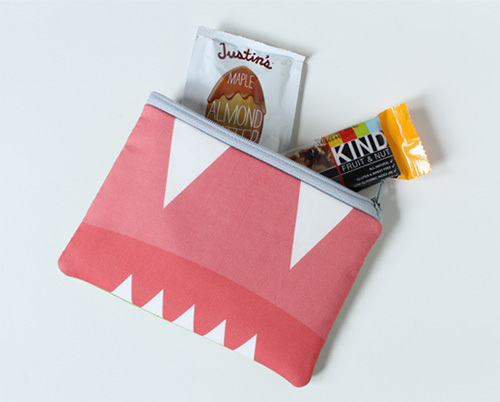 This reward is a hand-made snack pouch with custom printed fabric and filled with some of the Goodie Monster’s favorite treats. Check out the campaign on Kickstarter. 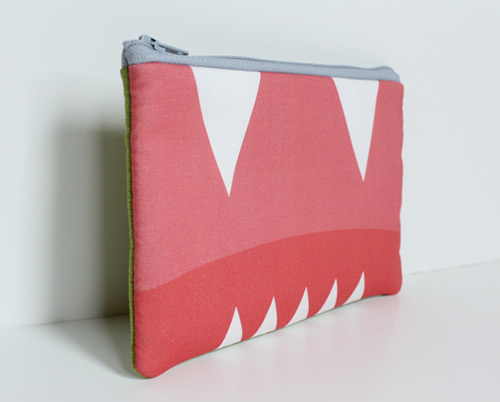 The Goodie Monster Snack Pouch measures approximately 4.5×7 inches and has a gray zipper, green back and custom monster mouth front. Thanks to Allisa Jacobs for crafting each snack pouch. 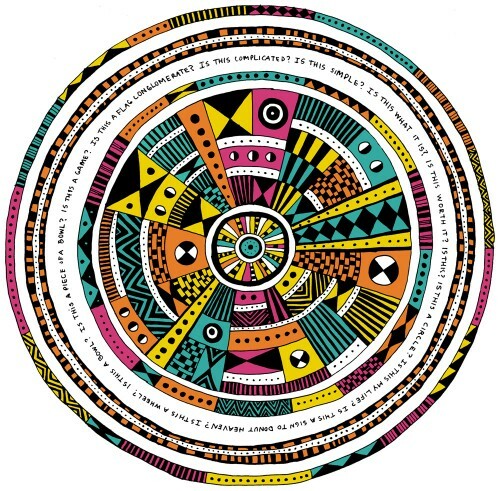 Last year I created some lettering for Hanna Andersson to use in their catalogs. This year, they got back in touch to letter more phrases for their Best of Summer book. Super sweet and perfect for their Swedish-inspired basics, especially their striped pajamas (for kids and adults alike). One of the rewards that we are offering as part of a Kickstarter campaign to make more Goodie Monsters is a poster. 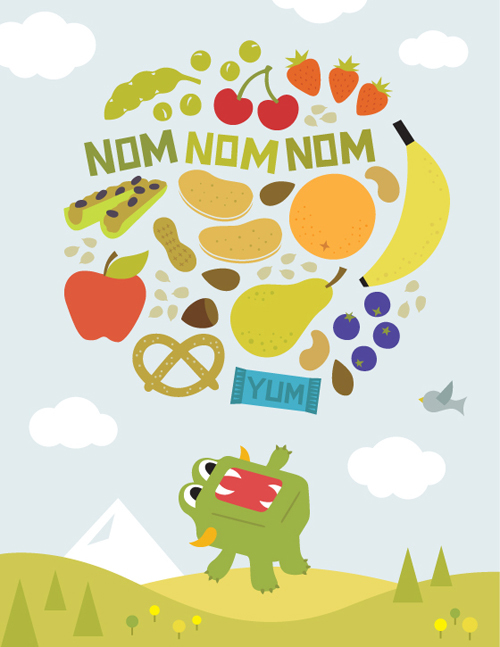 The Goodie Monster really loves to snack and has no problem telling the world all about it. 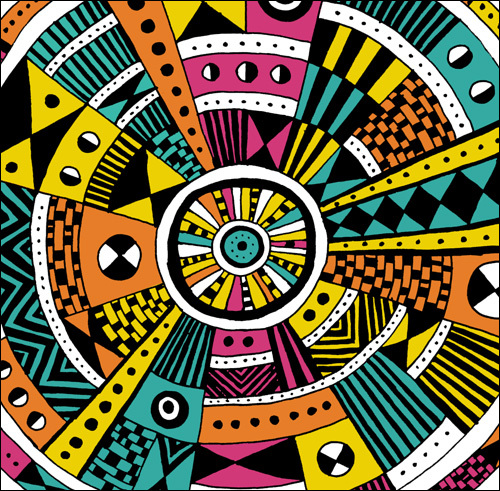 Check out the project on Kickstarter and see some of the other great rewards we have for people who back the project. Mark Jacobs and I are in the midst of a Kickstarter effort to make more Goodie Monsters, so we are offering rewards for people who support the project. This reward is a gray American Apparel T-shirt with a hungry monster character on it. Locally screen-printed in Portland, Oregon, the shirt is available in Men’s, Women’s, and Toddler/Youth sizes. 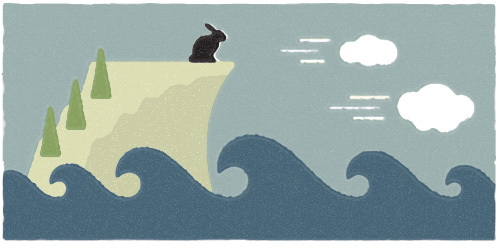 Is he waiting for cherries and plums to fall from the sky into his gaping maw? Is he letting out a giant monster burp after having eaten too many fig bars? Is he merely bellowing his appreciation of healthy snacks? All of the above! 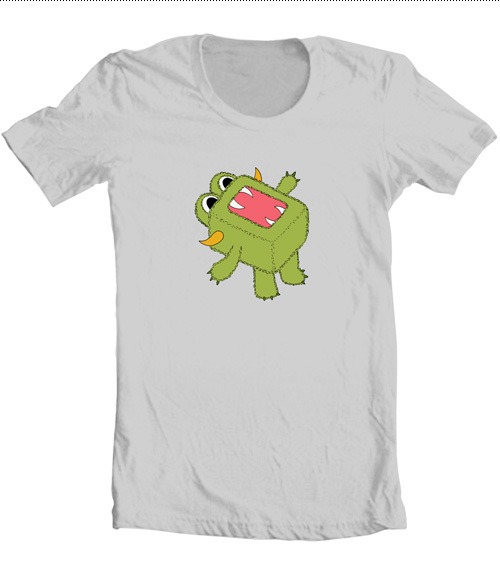 To get a monster t-shirt and support us, check out the campaign on Kickstarter. Goodie Monster practicing the tried and true "baby bird" maneuver. He must have practiced a lot of yoga to get into this position. Goodie Monster says it with fuzzy type. As part of our efforts to raise money to create more Goodie Monsters, we are offering rewards for people who back the effort. 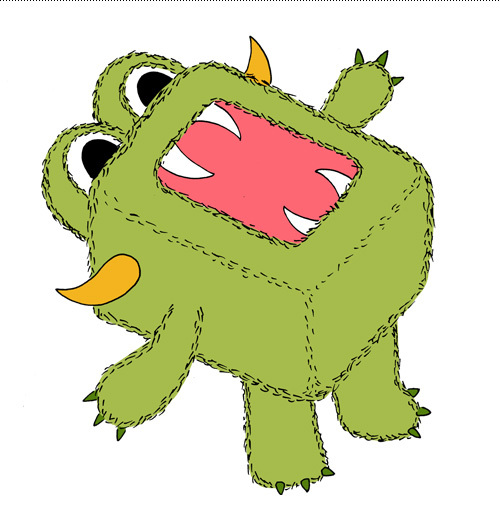 This reward is a 3″ custom designed miniature replica of the Goodie Monster with moveable arms, produced by Crazy Label. To get 1 of 100 toys produced and support the project, check out the campaign on Kickstarter. 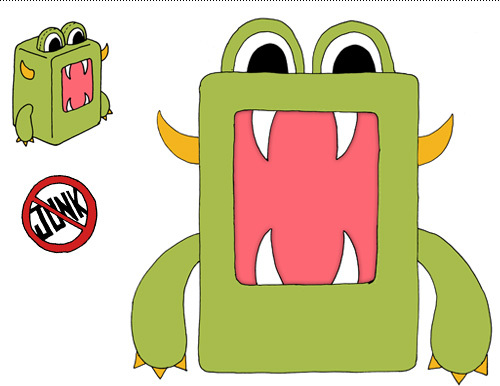 Initial sketches for the Goodie Monster toy. Toy prototype master skins from Crazylabel. 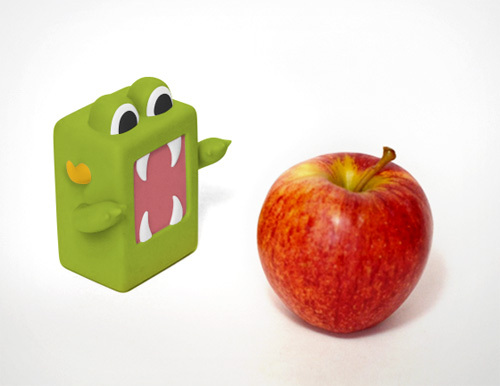 Colored toy prototype - a very hungry but not very intimidating Goodie Monster. 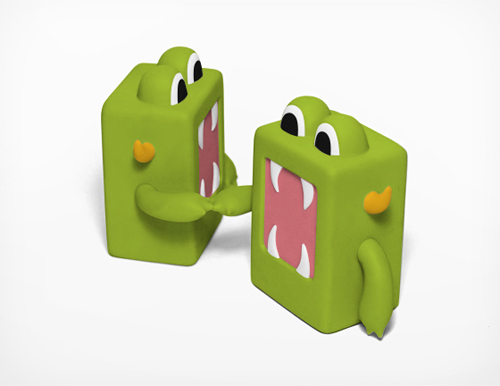 Colored toy prototype - if there are two Goodie Monsters, fist bumps happen.